I'm new here, so much so that this is the first post for me. So, howdy! Brief background - Long time sportsman ( read - all my life ) grew up back east when cockbirds, grouse and rabbits were plenty and traditions were hard and steadfast the first day of small game season. I've had GSP's, English and American Labs all the while...(35+ years ago ) That was then and this is now. I've lived inthe wets for 20++ years. I've not had a gun dog for over 17 years. However, times have changed and the deep seeded urge to walk the frosted prairie in search of Roosters is too daunting to deny. My needs are - smaller more compact bird dog that works kinda close but no "shoe polisher", points with authority and retrieves willing. kinda sorta led me to the Brittany... the caveat is... I'm not long on time for training ( the career/job thing gets in the way ) so I'm looking for a well started dog. However, there are soooo many out there that how's a guy to know who good, who's not... who's in it just for the money and who's in it to place good dogs with good homes? Who's got the reputation and will stand behind their breeding and training? so... I'm tipping my hat to all of you to help me find the breeders/trainers with integrity and the desire to place a good dog (started) with a good family. As most certainly this dog will be a big part of our family. Again, hello! ... and I'm looking forward to this discussion. Where are you located? Do you want a male or female? How much money are you willing to spend on a started/finished Brittany? You need to do your due diligence on the breeder. Look at the pedigree. There are a lot of things that go into finding the right dog for you. A good breeder should help you with the process. I'm sure others will offer some additional advice. Good luck. Feel free to email me with any Brittany questions as I'm quite familiar with the various Brittany lines having had Britts for over 20 years. Money is pretty dependent on where the dog is at in the training. I realize I'm gonna more than likely be in the 1500-2000 range. What is important to me is that he's a pheasant dog, other stuff like sharptail etc. is a bonus. retrieve at least to me. The pedigree isn't that important if he's a well rounded "hunter" I'm realistic to know that it's only paper and every dog is different and proof is in the field. waddya think ... am I in the ballpark? I can't help at all with your search but I do think you have chosen the right breed. 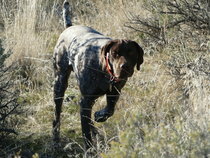 Brittanies are a really good hunt - point - retrieve breed. My own experience of training this breed showed me that although they hunt and point very readily, not all of them like to retrieve quite so much. A great deal of the training I had to do with the brits I owned was on the retrieving. Check the retrieving of any dog you are interested in before you buy. I hope you were able to follow what I PM'd you. I think at $1,500 to 2,000 you are in the ballpark. Might have to stretch to $2,500 for the right dog. Did you see this post for a Brittany for sale? Dakotazeb wrote: Did you see this post for a Brittany for sale? Beat me to it! If, after conversations, this dog is still a prospect, l'd fly out and see the dog work. Do it fast. If all is as portrayed (as seems very likely), this dog may not be available long. The reality is if you're willing to compromise a little (examples: spayed female instead of a male, or the need to spend some time working on retrieving) ) and obviously drive a distance or fly to see the dog work, there are always more good dogs than good homes for them. You can get great deals on a fine dog if you're willing to not rush, compromise and can say no. Put a "dog wanted" ad up on this and a few other hunting dog sites. Probably "training" is not the right section to get direct responses. Sometimes you have to just jump on the right situation. Don't think I would over think this one. This guy is trying to do what is best for the dog and is selling it at a big loss. A breeder has to pay the bills and can't sell dogs at a loss. Personally I don't think you are anywhere near "in the ball park" from a known breeder and trainer. Maybe a field trial washout which can be a great choice. greg jacobs wrote: Sometimes you have to just jump on the right situation. Don't think I would over think this one. This guy is trying to do what is best for the dog and is selling it at a big loss. I note this is several days later and no further post from OP, who was going to contact gentleman running the ad. There's not much "research" to do on a hunting dog where you can see him work, presuming breeding or competition is not in the dog's future. Maybe check hips or parents' hips, depending on age and breed. Talk to seller, get additional pictures or video,talk to wife, talk to seller, fly or drive, see the dog, buy or don't. He who hesitates..
Shopping for dogs is fun, but if I wanted a Brit, I'd be on the phone right now. And then probably in a car. I've driven a long way to see a dog. Last edited by Steve007 on Tue Sep 18, 2018 8:45 am, edited 1 time in total. Of course not. Sorry if I came across as critical. I just thought it was an interesting and potentially an excellent possibility, and was curious. Shopping for dogs is interesting even when someone else is doing the shopping! I sometimes read dog ads just for fun. I'll admit it once led me to buy a dog, so it is risky. I hear ya... no worries... it’s exciting and anxiety filled all mixed together. See ad. All is explained there. And the ad was placed only four days ago. I do not know this seller, but it looks good to me. There are always more fine dogs available for valid reasons than good homes for them. I don't care much to take the slow process of a puppy, but I like training and working with mentally-stable socialized young -- or not so young-- dogs. It has worked out well for me. A few things. That guy isn't a kennel. Its a dude that hunts. The dog isn't a trial prospect that didn't have the wheels to compete, or didn't take the steadiness training like she had to, its a meat dog, one with no potential for breeding as she's spayed. As someone that's fostered a handful of dogs, reading between the lines, I see a dog that might not be adjusting to new little humans in the home. That's a SWAG though based on his post. But for OP's purposes, a dog to walk over hill and dale and point and retrieve your birds, she might be the ticket. Jamie Daniels has a bunch of Poimters and setters available. Take a look at his Facebook page, Daniels Kennels. Most any pro trainer will have started dogs right now. They are fresh off the prairie all you need to do is pick up the phone and start dialing. Ike Todd, Jamie Daniels, Luke Eisenhart, Talmage Smedley, and Sean Derrick would all be good places to start. My recommendation. L'Etoile de Norde Kennel in North Dakota. Mark Dinsmore is a breeder with integrity and awesome French Brittany dogs. I am not affiliated with him in any way. I have a French Brittany for my hunting here in Massachusetts and have several friends here who do as well. The breed is awesome.